A young nobleman makes a promise to Queen Elizabeth to never grow old… and he doesn’t. He lives for centuries without major incident until, after narrowly escaping death, he wakes up as a woman! A remarkable adaptation of Virginia Wolfe’s novella that questions the very nature of gender. SALLY POTTER began her career working in the BBC and spending her spare time making experimental films. She then studied as a dancer and theater director. She also was a member of several music bands in the late 80’s. Orlando brought her more renown as a film director, and she has continued to write and direct films, picking up a number of prizes along the way. This screening has been generously sponsored by Vadim & Kristina Oss. In this true story from the 1967 Detroit riots, police officers responding to a noise complaint incite a series of events that destroy lives. A hair-raising look at a dark chapter in American history that also sheds light on our present. WARNING: graphic violence and language. This year we are showing a number of films which give different perspectives on racism in our county. Detroit is set 60 years ago but shows how whole communities of people of color can be terrorized by only a handful of individuals when then social institutions, like the police and judicial system, back them up. This is not a documentary, but it is a powerful, emotional drama based on true events, filled with dynamic filmmaking and flashes of truth that will stick with you. The film was controversial for it's depictions of violence, which are harrowing but also powerful. Kathryn Bigelow graduated from the San Francisco Art Institute where she studied painting, and went on to apprenticeships with artists like Richard Serra. She spent some time being a starving artist, crashing in an artist’s loft in NYC where she met Julian Schnabel (Diving Bell and the Butterfly). While teaching at CCA she made her first short film, The Set Up. Her first feature Loveless was shot in 1981, and she continued to forge forward in Hollywood, directing a number of violent and splashy action films. It was when her film The Hurt Locker received its Academy Award her reputation began to soar. We start the year with a trip to the de Young. 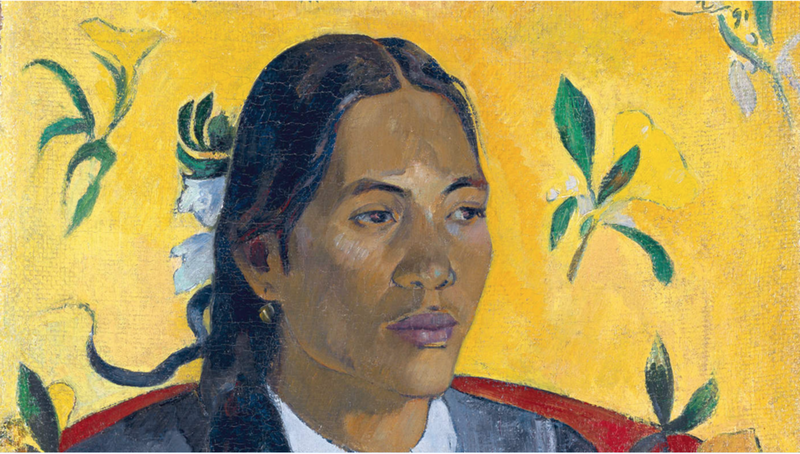 This exhibition explores Gauguin’s inner quests and imaginings—his spiritual journey—and how his intimate relationships with his wife, other artists, and people he encountered during his sojourns shaped his experiences, his work, and his development as an artist. A special exhibit not to be missed! 1 pm A picnic in Golden Gate park! This film has been generously sponsored in memory of David Wiegand by Topher Delaney and Calvin Chin. A neo-western that tells the tale of forbidden love between two cowboys. This box-office hit full of Hollywood stars makes for a compelling example of how damaging sexual repression is for everyone involved. Even in the last 30 years, life for gay people in the less populated states has been a difficult and harrowing one. The need to hide ones sexual identity is often internalized, and this thoughtful and absorbing film lays out in stunning detail the damage that hiding does – the fight between who you really are and who other people want you to be. Stunning performances made this one of the most popular of all gay films and its story is one which still illustrates how dangerous being gay can be in the wrong place. Ang Lee is a Taiwanese director whose films are known for their emotional charge, which critics believe is responsible for his success in offsetting cultural barriers and achieving international recognition. His early films The Wedding Banquet and Eat Drink Man Woman explored the conflicts of tradition and modernity. He made the transition into English language films with The Ice Storm, Sense and Sensibility, and Hulk. His two Academy Awards for directing came for Brokeback Mountain and The Life of Pi. This screening generously sponsored by Jasmine Delung. In 1431, 19 year-old Jeanne d'Arc is placed on trial on charges of heresy. If found guilty, the sentence is death. This film uses the historic transcript of her trial and its actress gives one of the most powerful performances in film. It is as if you were there! Considered one of the most influential films in history, this film showed the power of the close-up, and its great emotional impact. It’s a rare drama based on real facts—the record of the trial is used verbatim. No additional dialogue is need to make this riveting and astonishing. Its a portrait of the time and its cruelties in the name of religion. The acting is so authentic, the experience likely pushed the actress, Maria Falconetti, toward her eventual suicide. A Danish director who made very few films. Dreyer was born out of wedlock and was put into an orphanage by his real father, who was his mother’s employer. His early life was extremely unhappy, but he managed to leave home at 16 and work in early film writing title cards. His first films were badly received, and he fled to France hoping to have better luck. There he befriended Jean Cocteau and Jean Hugo, and made his first classic: The Passion of Joan of Arc. This was followed by Vampr, one of the earliest horror films. Neither film was a critical hit, and he had to wait a decade to make The Day of Wrath, a study of witch persecutions in the seventeeth century. He only made two more films, Ordet and Gertrude, but in time he has become considered one of the great Scandinavian directors.